One of the more interesting features that arrived with the larger screen iPhone Plus models is the ability to view the devices Home Screen, where app icons are shown, in a rotated sideways horizontal format. This places the Dock onto the side, and kind of resembles a tiny iPad. To rotate the iPhone Home Screen, you simply need to turn the iPhone into a horizontal position, and as long as Orientation Lock is not on, it will rotate. Usually. 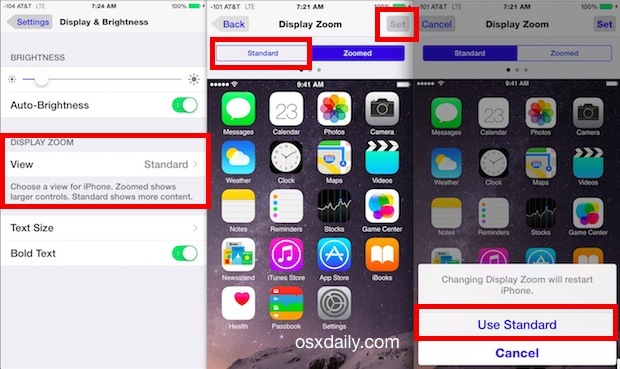 Sometimes the Home Screen on iPhone Plus does not rotate while other app screens do rotate, however, but the reason for this is quite simple; it’s the iPhones Display Zoom settings. Why is My iPhone Plus Screen Not Rotating? Here’s the Fix! This relates to ALL iPhone Plus devices, including iPhone 7 Plus, iPhone 6 Plus, and presumably any other iPhone Plus that has the capability of rotating the screen, whether iPhone 7S Plus and iPhone 8 Plus too. Important: Always check to make sure Orientation Lock is not turned on, visible by a little lock icon with a arrow around it in the status bar. That setting will interfere with the ability for the screen to rotate in all views of iPhone, whether in specific apps or just the icon filled Home screen of the device. If you have the display set to “Standard” and the Orientation Lock turned off and the screen is still not rotating, try placing the iPhone into landscape mode and giving it a good shake, sometimes the accelerometer becomes unresponsive or less sensitive and this almost always resolves that issue. Myself and many other users have a strong preference to use the Zoom View, it makes everything on the big screen appear larger and easier to read (that alone makes a very strong argument for picking iPhone Plus, though it will spoil you), but the Zoom view does not allow for Home Screen rotation. Thus, if you want to rotate the view where your icons display and have the iOS Dock on the left or right side of your iPhone screen, you must use the “Standard” view for the devices display. With the Home Screen rotating, you can think of the iPhone Plus as a smaller iPad, which also has the same rotation ability, except that the Dock gets rotated with it. Simple enough, right? You need to pass this information on to the Apple help desk staff, i had contacted them as to why my phone was doing it and my sons wasn’t and they did not tell me that. My son worked it out for himself. I’ve been trying to figure out how to prevent home screen rotation without orientation-lock preventing other apps from rotating the screen. As an extra bonus, zoomed view also disables the even-more-annoying split-screen horizontal view in the Mail app. I followed your instructions but my screen won’t rotate on the home screen. Actually, I had it in standard mode and it wasn’t working. I temporarily set it to Zoom view and then reset it back to standard view. It made no difference and no matter how hard I shake the phone it simply won’t rotate. Any other ideas? Mine too! I want mine to turn and can’t get it to. But u can’t find anything about fixing that issue. Annoying! Same here..i`ve done all the trouble shooting to no success. Thanks fir your help. For me it was finding the orientation lock. It is hidden in that swipe up menu that hides at the bottom of the phone. I hate that. Every time I click on something towards the bottom of the phone it pops open & I’ve touched something I did know about–put myself in airplane modes a dozen times now. Anyway to lock that thing up? That worked. Little usability issue Apple. Thanks for sharing! I had the same problem, and found your solution worked just fine. Giving up a feature is not a satisfactory solution. thank you so much. The screen rotation is so f-ing annoying on the home screen. Who thought it would be a good idea for the apps to move instead of rotating? rotation lock is a pain if you ever watch videos. So simple, yet so poorly implemented. 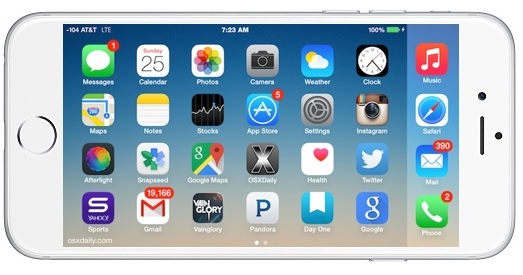 I agree, I wish the apps would stay in the same place but change orientation in that place. Then our apps would not be jumping all over the place on the phone but would still be readable in a sideways view. I’m glad I came across this site. This solved my problem. The folks at Apple knew nothing. Hi guys I have same bropleme with iPhone 6 plus. Now the camera it’s making the pictur reverse. If someone have solution pls contact me. Thanks man you solved my problem. For those who it worked for. What os and were you on that version prior to fixing? Steve, exactly the same situation with new iPhone 6s Plus, iOS 9.0.1. Orientation lock is off, standard display (not zoom). Talked to Apple support for an hour yesterday, but no solution. Tried resetting Standard to Zoom, caused a ‘restart’ that was in fact a dead phone, so had to use home/power to restart. Then set back to Standard mode, another ‘restart’ that again required home/power to restart. If I view a website horizontally and exit the site with the home button, the home screen switches to horizontal mode, but will not return to vertical mode unless I press sleep button, then home button. Comes back vertically. Zoom disabled, rotation lock disabled etc, but inhale found if I change the orientation of my phone while viewing the home screen, it won’t rotate unless you scroll to another page. Likewise if it change the orientation back, again the screen does not move until I scroll to another page and the it rotates. Yep…it was the Orientation lock for me too. Easy fix. Thanks. I’m starting to think the way everyone is posting about here is how it’s supposed to work. It’s iOS 9.0.1-9.0.2. I think they just changed it so you can’t move the orientation while on the home screen. The home screen now follows the orientation of the app you are exiting, but doesn’t move back the opposite way until you swipe to the next home screen or open another app. I’m pretty sure it’s intentional. Exact same problem for me…I’ve done everything that you have with the same results. Have you found a solution? I have to agree with (Mason) I’m thinking (Apple), probably received a lot of complaints referencing unintentional (Home Screen) reorientation issues and decided to eliminate (Home Screen) Landscape ability in the (iOS 9.0.1-9.0.2.) software updates. I’m “almost” positive, because if you initiate (Landscape Mode) from inside an app (any App or App Folder), when you retreat back to the Home Screen, the display stays in (Landscape Mode), until either you go back into that App (or any App) or (any App Folder) and orientate back to (Portrait Mode). Or from the now “locked” (Home Screen) Landscape mode, you exit the (Home Screen) via the display On/Off button, then when you turn the display back on, the (Home Screen) will have reverted back to Portrait Mode all on its very own…..PLEASE DO NOT ASK ME TO REPEAT WHAT I JUST WROTE…I couldn’t do it if my life depended on it…. (Gun to the F–king head an all)…I actually just confused myself…..WOW!…..lol. Home Screen rotating exists in iOS 9, iOS 9.1, etc. If it’s not working for you, something is wrong and you need to troubleshoot. Probably the screen zoom. I tried some of the above fixes – I changed from standard to zoom, hit set and it rebooted. went back to orientation and hit set it turned off but didn’t reboot and now I can’t get it to turn on! This is reallly annoying. I guess I will be playing phone tag tomorrow. I have tried all of the above but when I watch movies it still does not rotate. I’m getting feed up already. This is a new phone just switch from Samsung to iPhone 6s Plus. Thank you so much!!! My problem was the opposite. I felt that my phone was rotating far too often. So I went into the settings and turned off the “Standard” view. THANK YOU, THANK YOU, THANK YOU! This was driving me crazy. Really very helpful😇. Once I changed from zoom to standard .. the set button grayed out.. Damn. Then I found your comments and then the guy who knew where to find the command to turn off lock🙏🏽 made my day. Thanks to both of you. If everything above fails. Go to settings > general > accessibility scroll down to AssistiveTouch and turn it on. It allows you to rotate the screen manually. Ok thank you for this article, frankly, but I would like to make sure Apple knows that this is not user friendly! It’s not intuitive to find functionality regarding the size of the icons together with the fact that they can rotate or not. All under the hopeless “View” denomination…!!! I had to lookup the Internet to find out. 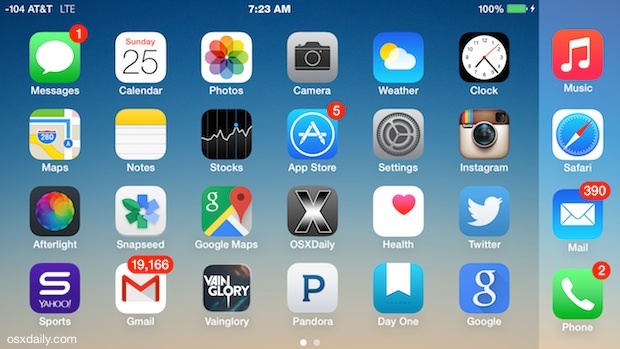 Guys… home screen rotation ONLY works on “+” (plus) models of iPhones. Why all apps can rotate but Apple can’t do it for my regular iPhone 8? – don’t know… it’s not taking any more pixels rotating icons. With the update to iOS 12.x it appears that home screen no longer rotates. I’ve made all the changes and have the iPhone XS max. All the apps rotate (messages, mail, etc.) but the home screen will not rotate. I really liked the rotation, especially now that i can charge wirelessly but the charger is designed to hold the phone in landscape better than portrait.